Brutal Power makes his debut on Thursday as he heads to Echuca with Meteor Light. Brutal Power is in race six, the Maiden Plate over 1100m with Patrick Moloney to ride and jumping from barrier two. “He’s drawn nicely and he’s got gate speed so he should be able to put himself on the speed,” Moroney said. “Ideally I’d rather he didn’t lead as he won’t learn much from that - he’s still learning although he’s had a bit of practice. Meteor Light (pictured) runs in race eight, the Benchmark 70 Handicap over 2100m with Jamie Mott to ride and jumping from barrier five. The import finished runner-up over 1700m on a heavy track at Warrnambool last start and Moroney feels is at an ideal distance today. “He’s trained on really well and this is more like his right trip,” Moroney said. 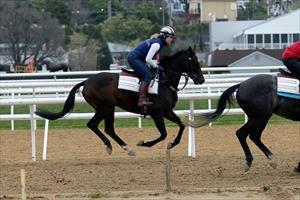 “He’s drawn to get a good run and the soft conditions suit.